Last year at the 2012 RT Booklovers in Chicago, I released a first-of-its-kind study that analyzed indie ebook sales data. 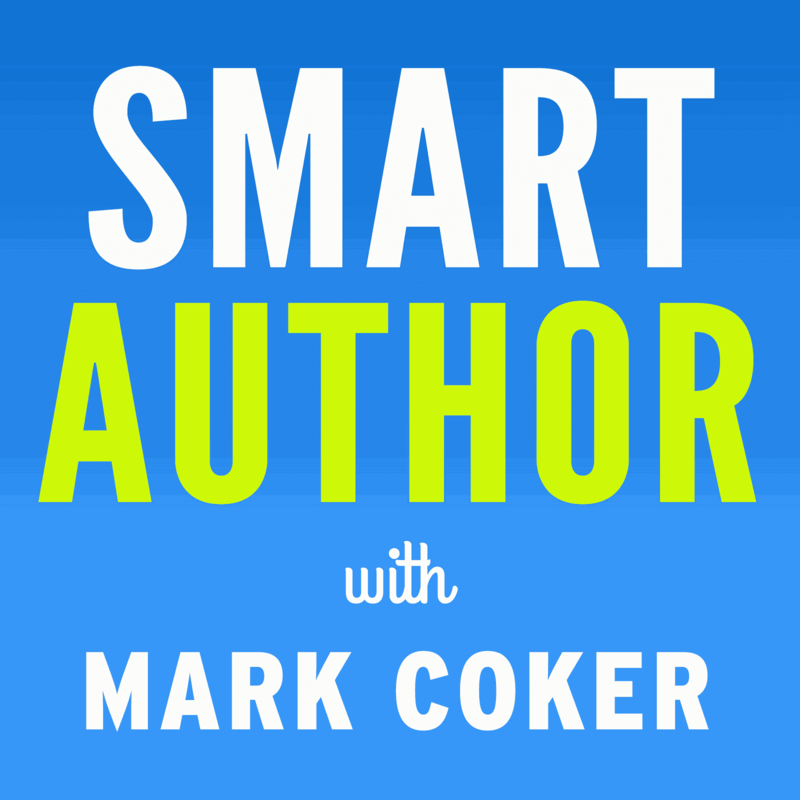 Our goal was to identify potential factors that could help authors sell more ebooks. For the study this year, we analyzed over $12 million in sales for a collection of 120,000 Smashwords ebooks from May 1, 2012 through March 31, 2013. We aggregated our sales data from across our retail distribution network, which includes the Apple iBookstore, Barnes & Noble, Sony, Kobo and Amazon (only about 200 of our 200,000 titles are at Amazon). As the world's largest indie ebook distributor, I think our study represents the most comprehensive analysis ever of how ebooks from self-published authors and small independent presses are behaving in the marketplace. As I mention in my free ebook, The Secrets to Ebook Publishing Success, its helpful to imagine dozens of levers and dials attached to your book that you can twist, turn and tweak. When you get everything just right, your book's sales will increase through viral through word-of-mouth. In my Secrets book, I refer to these tweakable things as Viral Catalysts. A Viral Catalyst is anything that makes your book more available, accessible, discoverable, desirable or enjoyable to readers. This survey attempts to identify Viral Catalysts by analyzing the common characteristics of bestselling (and poor-selling) Smashwords ebooks. We posed a series of questions to our data - including several new ones - to reveal answers that might help authors reach more readers. Do frequent price changes help authors sell more books? 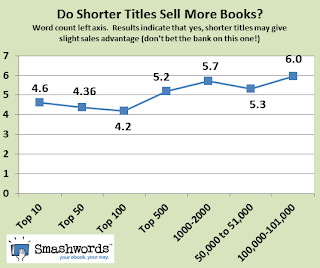 Do longer or shorter book titles sell more books? Do longer or shorter book descriptions sell more books? How do sales develop over time at a retailer, and what factors might spark a breakout? Do longer or shorter books sell better? What's the average word count for the 60 bestselling Smashwords romance books? What does the sales distribution curve look like, and how many books sell well? How many words are the bestselling authors selling for a penny? 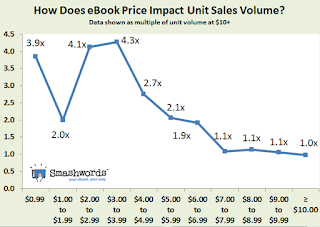 What are the most common price points for indie ebooks, and what changed since last year? How many more downloads do FREE ebooks get compared to priced ebooks? 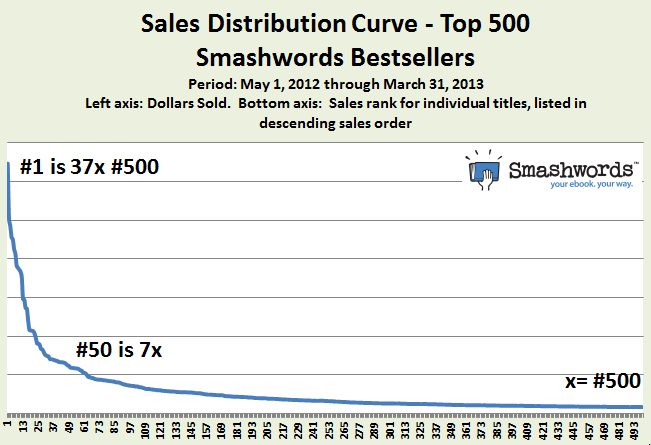 How have Smashwords sales grown at the Apple iBookstore in three years? How does price impact unit sales volume? 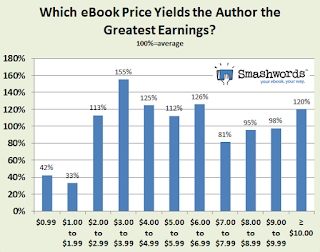 What price points yield the greatest overall earnings for authors and publishers? What does the Yield Graph portend for the future of publishing? 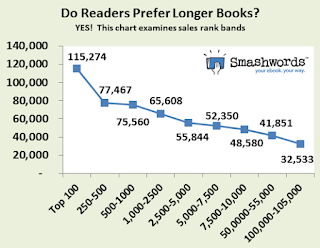 New Smashwords Survey Helps Authors Sell More eBooks from Smashwords, Inc. Most books don't sell well, but those that do sell well sell really well. This finding wasn't a surprise. Just as in traditional publishing, very few books become bestsellers. then share it on Facebook, Pinterest and Twitter! However, the underlying dynamic of the power curve is extremely significant, especially when you consider it as a framework for evaluating the survey's findings. As a title moves up in sales rank, its sales grow exponentially. We see this in our sales results all the time. On any given day, a #1 bestseller in an ebook store might be selling twice the number copies as the #5-ranked title on that day, and triple or quadruple the number of copies as the #10 bestseller. In our data over this 11-month period, the #1 Smashwords bestseller, measured in dollars, sold 37 times more than the book ranked #500, and #500's sales would put a smile on most authors' faces. The opportunity for every Smashwords author and publisher is to make decisions that cause their books to move up in sales rank. This is power of my Viral Catalyst concept. When you consider that there are potentially dozens if not hundreds of factors that can make your book more (or less) discoverable, desirable and enjoyable, then you realize that you - the author/publisher - have more control over your book's destiny than previously thought. Your opportunity is to make dozens of correct decisions - big and small - while avoiding the poor decisions that will undermine your success. The next finding, when viewed through the lens of the power curve, is especially significant. For the second year running, we found definitive evidence that ebook readers - voting with their Dollars, Euros, Pounds, Krone, Krona and Koruna - overwhelmingly prefer longer books over shorter books. The top 100 bestselling Smashwords books averaged 115,000 words. When we examined the word counts of books in other sales rank bands, we found the lower the word count, the lower the sales. Now consider how authors can use this finding, combined with the knowledge of the power curve, to make smarter publishing decisions, and to avoid poor decisions. Often, we'll see an authors with a single full-length novel break the novel into chunks to create a series of novellas, or worse - they'll try to serialize it as dozens of short pieces. When you consider that readers overwhelmingly prefer longer works, and you consider that bestselling titles sell exponentially more copies, reach more readers and earn more money than the non-bestsellers, you can understand how some authors might be undermining their book's true potential. Like every finding from this survey, you should use this information as one data point. There will always be exceptions to any rule. If your story deserves 50,000 words - nothing more and nothing less - because this is the length packs the biggest pleasure punch for readers, then by all means don't bloat your perfect story with extra words just because the data shows that longer books, on average, sell more. Do what's right for your story because that's what's right for your reader. 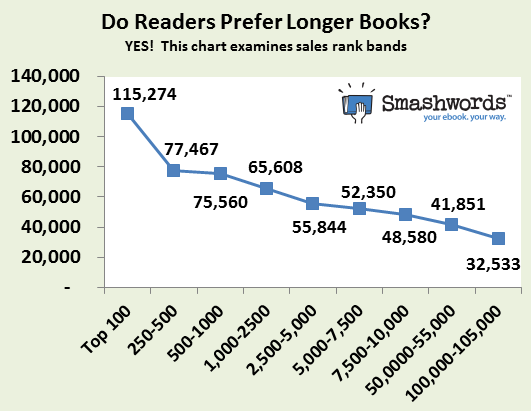 This year we asked our data if bestselling books had shorter or longer titles. We looked at character count, which indicated slight advantage for shorter titles, and then we looked at word count, where the advantage appeared to be more pronounced. The top 100 bestselling Smashwords books averaged 4.2 words in their book title. For titles ranked #1,000-#2,000, the average word count was 5.7, or about 36% more words than the top 100. Books ranked #100,000-#101,000 (not a sales rank any author wants! ), the book title word count was 6.0 words. Why might shorter book titles have an advantage? I can only speculate. Maybe shorter titles catch the reader's eye and attention more effectively. After all, reading requires mental energy, so maybe the additional mental energy to read and comprehend a longer title creates friction that causes some readers to click away? Or maybe some retailers' inability to list super-long book titles on the merchandising page reduces effectiveness? My advice: Think less about word count and more about choosing a title that, like good writing, is concise, clear and intriguing. 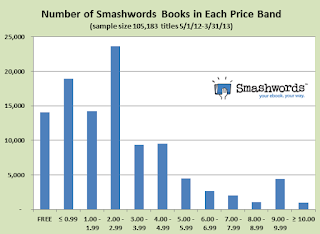 At Smashwords, our authors and publishers set the prices. The most popular price points are FREE through 2.99. They chose $2.99 more frequently than any other price point. In last year's survey, $.99 was a more common price point than $2.99. In this year's survey, $2.99 was about 60% more often. $.99 remains a popular price point. $5.00 and up has lost favor with indie authors and publishers compared to the same data a year ago. How does your choice of price impact the number of books you sell? It's an important question, because as an author or publisher, you want your words to touch the eyes of readers. As you might expect, we found there's a definite relation between price and unit sales volume. Lower prices generally sell more copies than higher prices. But not always. We normalized the data so we could understand how the average book priced at a given price would perfom compared to a book priced over $10.00+. We set $10.00+ as equal to "x." So, for example you'll see in the chart that $.99 is 3.9x. This means that a $.99 book will on average sell 3.9 times as many books as a book priced over $10.00. A $2.99 book sells about 4 times as many units. Note how books priced between $1.00 and $1.99 significantly underperform books priced at $2.99 and $3.99. $1.99 appears to be a black hole. What price moves the most units? The answer is FREE. Although not shown in the chart, my presentation includes an analysis I performed of our sales at the Apple iBookstore over the last 12 months. FREE books, on average, earned 92 times more downloads than books at any price. If you've written several books, consider pricing at least one of the books at free. If you write series, consider pricing the series starter at FREE. Nothing attracts reader interest like FREE. But remember, it's one thing to get the reader to download your book. It's an entirely different challenge to get them to read it, finish it and love it. Smashwords can get your book priced at FREE at every retailer. 6. The Yield Graph: Is $3.99 the New $2.99? 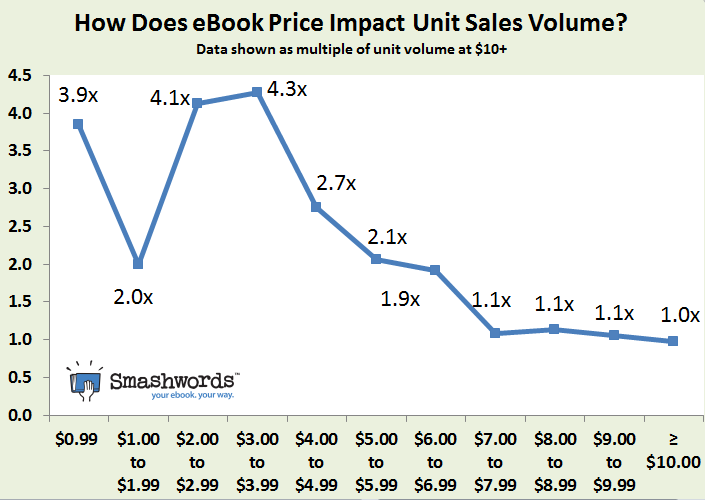 It goes without saying that a $.99 book will usually sell more units than a $10+ book. But will the $.99 book make up in volume what the $10+ book earns in margin? That's the question answered by the Yield Graph. We computed book earnings for all the books in each price band, and then divided the results by the number of books in that band to determine the average yield of for a book priced in each band. We labeled each bar with a percentage so you know how the yields of each book in that band, on average, compare against against the overall average of all the bands. So, for example, books priced at $3.99 will earn about 55% more than the average book at any price. Books priced at $1.99 are likely to earn 67% less than the average. One surprising finding is that, on average, $3.99 books sold more units than $2.99 books, and more units than any other price except FREE. I didn't expect this. Although the general pattern holds that lower priced books tend to sell more units than higher priced books, $3.99 was the rule-breaker. According to our Yield Graph, $3.99 earned authors total income that was 55% above the average compared to all price points. The finding runs counter to the meme that ebook prices will only drop lower. I think it offers encouraging news for authors and publishers alike. It also tells me that some authors who are pricing between $.99 and $2.99 might actually be underpricing. What might account for the magic of the $3.99 price point? First, I think it means readers will pay for quality books. You don't become a bestseller at any price - including FREE - if you haven't written a great, reader-pleasing book. Next, it might indicate that some percent of the readers are shying away from the ultra-low price points. Anecdotally, I've hear multiple reports from authors where they raised prices and unit sales increased. While I do believe some of this is happening, I don't think all readers operate the same mindset. As much as we all would like to discover that one magic secret for success, reader behavior is much more nuanced and diverse. Diversity of behavior was certainly the primary high-level finding in my ebook discovery survey in September, 2011. We found that different readers have different methods of discovering books. Some readers will be attracted to low-priced books, and other readers will be repulsed. Viva diversity! Other highlights from the Yield Graph: Books priced between $.99 and $1.99 continue to underperform when we look at the book's total earnings. $1.99 performs especially poorly. It's a black hole. I'd avoid that price point if you can. Price the book instead at $2.99 and you'll probably earn more, AND sell more units if your book performs near the average. I think the most important findings of the entire study are found in these last two charts above about how price impacts unit sales, and in the Yield Graph, where I examine how price combined with unit sales impacts author earnings. The Yield Graph reveals why indie authors are gaining significant advantage over traditionally published authors. When an author sells a book, they receive two primary benefits. 1. They earn the royalty from the sale. 2. They earn a reader, and a reader is a potential fan, and fan is a potential super-fan who will rush to buy anything you publish, and who will evangelize your book to everyone they know. I'd argue that readership - the key to building your author brand and fan base, is more important to your long term success than a dollar in your pocket today. Indie ebook authors are earning royalty percentages that are 3-5 times higher than what traditionally published authors earn. Publishers are overpricing their books relative to indie ebook alternatives. This means that indie authors can reach more readers AND earn more money selling lower priced books at higher unit volumes all the while earning more per book sold than traditionally published authors at higher prices. The significance of these economic dynamics cannot be overstated. Allow me to break it down this way. An indie ebook author earns about $2.00 from the sale of a $2.99 book. That book, on average, will sell four times as many units as a book priced over $10.00. In order for a traditionally published author to earn $2.00 on an ebook sale, the book must be priced at $11.42 (if the publisher has agency terms, as Smashwords does) or $16.00 (if it's a wholesale publisher). Remember, traditionally published authors earn only 25% of the net, whereas Smashwords authors earn 85% net. If your book is traditionally published, and your publisher sells under the wholesale pricing model, you earn only about $1.25 for a book priced at $9.99, whereas an indie ebook author would earn $6.00-$8.00 at that price. If a reader has the choice to purchase one of two books of equal quality, and one is priced at $2.99 and the other is priced at $12.99, which will they choose? If the publisher prices at $2.99 to be competitive, and they have agency terms with the retailer, their author earns only 52 cents (25% net of the 70% list received by the publisher), compared to the indie author's take of $2.00. These economic dynamics will not play out well for large publishers or their authors. If ebook sales continue to increase as a percentage of overall book sales, and if print continues to decline as a format, and especially if brick-and-mortar bookstore closers continue or accelerate, it'll become increasingly difficult for publishers to hold on to their best authors. Publishers need to pray that print remains a strong-selling format, and that the physical bookstores stop closing. For now, print distribution - a benefit available only to traditionally published authors - is a strong selling point in favor of publishers. Even with the continued importance of print, I'm seeing signs that some bestselling indie authors are beginning to hold on to their ebook rights and do print-only deals with the publishers. Recent examples include Bella Andre with her Sullivans series, Hugh Howey with Wool, and Colleen Hoover with Hopeless. In a future world dominated by ebooks, publishers need to find a way to lower prices while increasing per-unit earnings for the author. It'll be difficult because the cost structure of traditional publishing is so high. Publishers aren't feeling the pain yet because the bulk of their sales are still coming from print. However, look at any ebook bestseller list and you'll see indie ebook authors are taking sales from the bigger traditionally published authors. I predict that within three years, over 50% of the New York Times bestselling ebooks will be self-published ebooks. It's possible I'm being too conservative. Indie ebook authors can publish faster and less expensively, publish globally, enjoy greater creative freedom, earn higher royalties, and have greater flexibility and control. It's not as difficult to successfully self-publish as some people think. The bestselling traditionally published authors already know how to write a super-awesome book. That's the most difficult task of publishing because the best books market themselves on reader word-of-mouth. Already, many successful indies, borrowing from the playbook of publishers, are assembling freelance teams of editors, cover designers, formatters and distributors. Tell me again, what can a publisher do for the ebook author that the author already do for themselves faster, cheaper and more profitability? As an indie ebook author, your e-rights are valuable. Don't give them up easily. Your indie ebook is immortal. It'll never go out of print. Your e-rights are an asset - much like an annuity - which will earn income for years to come. If you write fiction, great stories are timeless. Your book could earn an annuity stream of income for you and your heirs for many decades to come. In the presentation, I show charts of how books can sell over time. For great books, the sales continue long after the pub date. This doesn't mean that publishers will become relegated to the dustbin of history. 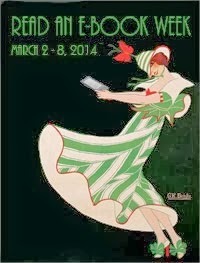 Many authors - including many bestsellers - will continue to want the support of a publisher partner so the author can focus on writing books rather than assuming all the responsibilities of a great publisher like the editing, proofing, packaging, sales, marketing, distribution, foreign rights and backoffice. I think the percentage who go indie will continue to increase. What do you think? Our study drew upon an enormous data set, and the findings are distilled down to averages. We also included both fiction and non-fiction in the survey, and didn't differentiate between the two. The vast majority of our titles and sales are fiction, so please consider that as you evaluate our findings. Your book is unique and may not conform to averages. Although some of our findings will help you make more informed publishing decisions, I urge you to use caution. Think of some of the Viral Catalyst ideas that came out of this study as the opportunity to fine-tune your publishing. Consider each finding as a single data point. Consider it as an option for possible experimentation. Data-driven decision-making can give you an edge, but the edge is worthless if you don't start with the foundation of a super-fabulous book. If you want to reach a lot of readers, write a book your fans market for you through their word of mouth and positive reviews. Don't let data-driven decision-making cause you to make stupid decisions. 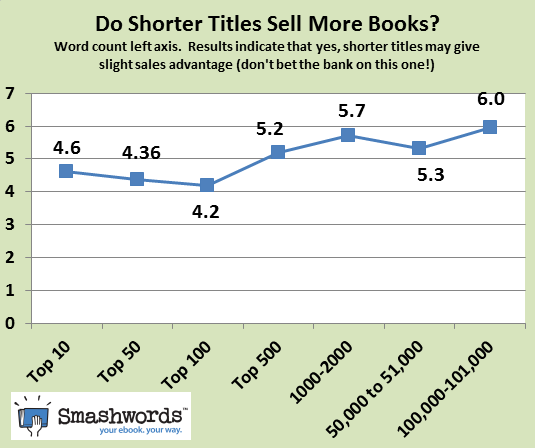 If the data shows (and it does) that shorter book titles might give you a slight sales advantage, don't change your title to two words if the absolute best and necessary title is seven words. If the data shows that books over 100,000 words sell the best (and it does), but you think your story works better at 70,000 words, don't bloat your story. Use common sense and do what's right for you book, and do what's right for your reader, and what's right for your personal ambitions as an author. Also consider that this survey, like last year's survey, will be read by thousands of other authors and publishers, and may influence their decision-making. Last year's presentation on Slideshare has already been viewed over 75,000 times (wow, that blows me away!). Today, $3.99 price point appears to be an underutilized opportunity because there are fewer titles than $2.99 and readers respond favorably to $3.99. However, if thousands of authors shift their pricing to $3.99 tomorrow, would the edge diminish? I don't know the answer to that. Thanks for reading. If you found this information useful, please share it with your friends. If you like the charts and what they represent, please post them to Facebook, Pinterest and Twitter and then link back to here so writers can benefit from the full survey. Our mission at Smashwords is to empower all writers with the tools they need to become successful authors. We provide the free ebook printing press, the distribution to major retailers and libraries, and the best-practices knowledge that helps self-published authors publish more professionally. This survey fulfills one element of the best-practices piece. I hope it helps all authors and publishers, even those who don't use Smashwords. If you're not yet using Smashwords, I invite you click here to learn how to publish and distribute with us.